Before, I was always of the opinion that the shape of my head is too small for a beanie, additionally I don't have voluminous hair to fill the beanie with. Last winter I could get away without anything on my head, this year and especially now, I'm looking for a nice beanie to keep my ears warm. For now, this is my selection: a burgundy shorter version from Topshop (1) which still fits very well into the autumn's punk-trend. The greenish one from & Other Stories (2) would match with my Kenzo scarf and I would totally go to the christmas market with Santa =D No honestly, I already had that beanie on and it looked well, but maybe too matchy though. The two-coloured one is from Roxy (3) and I think, I like this one the best since it is also not too long and have a more sporty look. 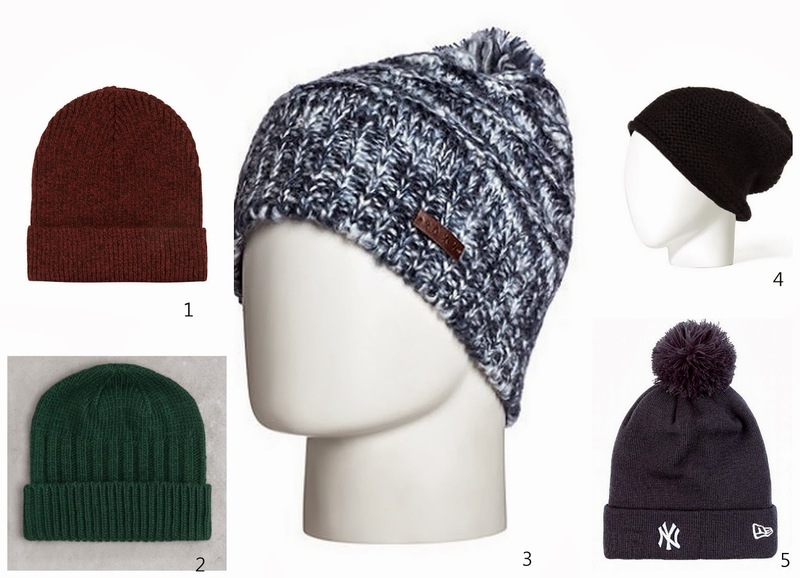 The Zara (4) is the most elegant one I guess, but I'm still trying to stay away from black clothes :) And the New Era Beanie (5) is the longest version, but still casual. A friend of mine just bought one of those and I was thinking of getting that, it had a really nice fit. Anyways, all this Online Shopping doesn't help, I need to go there and try them on :) What about you guys? Are you into beanies, if yes, what's your favorite? Which one should I go for?